Planning a trip to Israel? Get off the beaten track! Ask Zack Shavin about camel riding, Bedouin tent hospitality, and learn about traditional nomadic life. The camel is really a wonder of nature! It can drink water big time- 25% of it’s body weight, has 4 stomachs, and can even change it’s body temperature for desert extremes in order to minimize water loss! 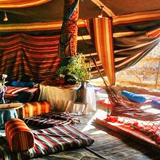 Have a traditional Bedouin tent hafla feast: Served sitting on pillows around a large tray of rice and meat with appetizers, freshly baked Bedouin bread, lemonade, tea, coffee, and for desert, honey and nut filled baklava. 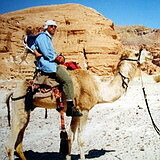 Contact Zack Shavin, veteran guide & biblical archaeologist at Land of Israel Tours about adding a bedouin or camel riding experience to your Israel tour program.